March 24, 2013 (Ramona) –“It all started with my horses,” Tammy Rimes told ECM at the grand opening of Hacienda de las Rosas Winery’s new Mission-style tasting room in Ramona. 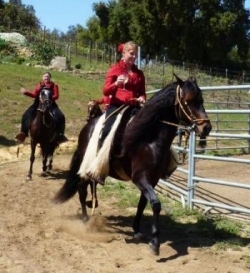 Tammy and her h usband, William Holzhaeur (now the winemaker), were living in La Mesa with their three children when Tammy began yearning to find a place to raise Peruvian Paso horses. They had already envisioned a name for their dream property – Hacienda de las Rosas—before discovering this picturesque property in Ramona complete with an old adobe home and a rose garden. View video of Tammy telling their story. Convinced they had found their destiny, the couple purchases the property in 1998, removed 600 dead apple trees, planted a vineyard and soon established a winery. They wanted to open a tasting room on site. But at the time, county ordinances were prohibitive. So they opened a tasting room in San Diego’s historic Old Town instead. Recently, however, San Diego Supervisors enacted a boutique winery ordinance that made opening a tasting room in rural Ramona a possible dream – so the couple built a Mission-style building to house a new wine-tasting room. They also created patios shaded by massive trees and a path that meanders to the stable and show ring beyond. “I was training in the stomach of my mother, “ Jorge Valenzeula, an esteemed trainer of Peruvian Paso horses from Hemet, told ECM. Later he demonstrated his skills and the smooth gait that has led this breed to be known as the Cadillac of riding horses. A quartet of riders demonstrated the horses’ unique gait. 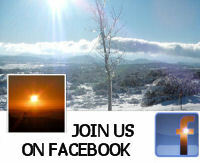 View a video. 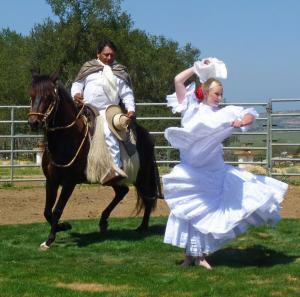 Among the most dramatic elements of the exhibition was the Marinera, a dance performing by Valenzuela astride a horse named Noble Soul, along with 16-year-old Julia Mann, who danced barefoot on the grass in the center of the ring. Valenzuela wears a traditional white pants and shirt similar to those of Peruvian plantation owners, along with a silk scarf and hat. He sits atop a traditional white mat of goat hair. He does not wear cowboy boots, since they would catch on the hand-crafted Peruvian stirrups. Brought by the Spanish to Peru with the Conquistadors, the Peruvian Paso was used by plantation owners and became isolated for some 400 years, making the Peruvian Paso among the purest bloodline horses in the world. Horses showed at the winery’s opening include some that have ridden in the Rose Parade and elsewhere. They are known for their “brio”, a term that means vigor and willingness to please. The opening also featured artwork displayed by internatiionally acclaimed artist Robert Kidd, whose depictions of Native Americans and Western themes are intricate in their detail. The award-winning artist’s commissioned portraits include former President Ronald Reagan and actor Larry Hagman. His mediums include carve leather, pen and ink, and watercolor. At the winery, guests savored Corazon ( a rich cabernet sauvignon), Rey of Rosas (syrah), Sombra (petite Syrah) Maximum (merlot) and Caballo Blanco (white merlot). Other offerings included a peach chardonnay and a sweet dessert wine. The winery also produces other offerings, such as port and tempranillo. Barrel tastings of port and brandy were also offered. True aficionados of Hacienda de las Rosas wines can sign up to join a wine club. Two levels are offered: Silver and Platinum. Membership in the Silver club is free: participants receive a 10% discount on wine and will have two bottles shipped every other month; members also receive two free tickets to a private Grape Stomp party, invitations to pickup parties, complimentary port and desert Valentine Day special, and free wine tastings at both the Ramona and Old Town locations, among other options. Membership in the Platinum Club costs $250 but includes such perks as two tickets to the Cygnet theater, two free tickets to a New Year’s Day brunch and ranch tour, an etched magnum bottle with signature wine, 2-3 bottles shipped every other month, invitation to purchase tickets for a private “Evening under the Stars” dinner with guest chef, plus all the benefits of the Silver club. The winery now produces wines from red grapes grown at the sunny slopes of its own vineyard and recently planted a Spanish white wine grape, Albiano. The white wines produced are from grapes grown elsewhere. Hacienda de las Rosas now also makes wines for about 15 other area vineyards. The new tasting room is open Saturdays and Sundays from 12 noon to 5 p.m. It includes a cozy leather chair and comfortable sofa for guests to linger while savoring wines, as well as gift items for sale and patio areas for saving views of the Ramona countryside. Guests can also stroll through the gardens, vineyards and horse facilities that spread out like a fan below a hill crowned by the owners’ adobe home. For more information, visit http://www.sdwinery.com/.